BetterJPEG is a streamlined image editing tool, designed to simplify image enhancement and optimization for JPG and JPEF files. It comes with an easy to use interface similar to Windows Explorer, so most Windows users will be familiar with it. As a result, you can quickly load photos via drag and drop or using the tree view. 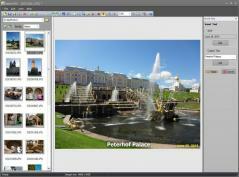 BetterJPEG can help you edit large amounts of images since it supports batch processing. Among the essential editing options it includes, you’ll find the ability to crop, rotate and flip photos, perform various adjustments and resize them. Furthermore, you can use undo/redo actions, zoom in and out, hide the status bar and toolbar, change the thumbnail style, attach photos to emails and even define default actions among other useful options. The application also allows you to use a red eye removal tool, convert photos to grayscale, apply text and reconstruct images using a certain number of passes. A batch utility to convert graphic files! Convert BMP to DXF, JPG to DXF, TIFF to DXF.